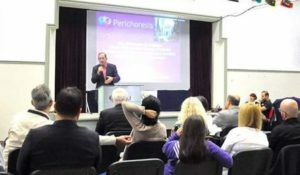 Our new member Perichoresis, part of the Greek Evangelical Church, has recently celebrated its two-year anniversary. Early this month, Periochoresis’ board and staff members, volunteers and partners gathered together in the Greek Evangelical school in Katerini to mark this important anniversary by listening to speeches and video messages from partner organizations. The participants had also the opportunity to hear from some refugee families assisted in Katerini in 2016 under the reunification program. During these surprise video calls, people helped by Perichoresis expressed gratitude to their Greek friends. “Thank you to all the participants – states Perichoresis Chairman Paris Papageorgiou – for their words of encouragement as well as for their partnership throughout the last two years. Perichoresis could not carry out its critical community-based work without our staff, volunteers and partners’ help”. Based in the Thessaloniki region, Perichoresis is mainly active in the field of food bank, day and night minor migrants shelters, refugees and asylum seekers support, training centres, and long-term care. Perichoresis and Faros – the other social NGO related to our member the Greek Evangelical Church, based in the Athens region – currently employ 80 social workers and about 50 volunteers. To know more about Perichoresis anniversary event, please read our member’s news.